Dental implants are an ideal replacement option for people suffering from the loss of one or more teeth, providing a secure base for further dental restorations. Dental implants enable patients to chew properly, retain their healthy teeth and feel confident and attractive. The use of dental implants is a scientifically proven treatment that has been successfully used in the last three decades by qualified dentists and surgeons worldwide. Nothing looks or feels as close to a natural tooth. Dental implants restore normal function and provide an enhanced aesthetic solution too. Dental implants are a lifelong solution. Take care of your implants and they will never require replacing. You can smile with confidence. Dental implants allow you to eat, talk and laugh without any inhibition. You will look younger for longer. Tooth loss causes jaw shrinkage, which in turn leads to facial sagging. 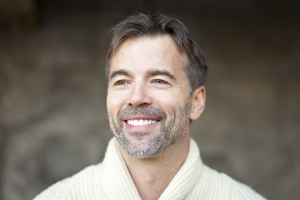 Because implants replace both the tooth root and the missing tooth, they give your jaw the essential support it needs to keep you looking youthful. You can use them in tandem with dentures. Implant-retained dentures eliminate the problem of denture slippage, allowing you to eat and talk without fear of embarrassment. A dental implant is an extremely strong and durable ‘post’ that is surgically implanted in the jaw bone to mimic the function of a natural tooth root. The implant is made from a biocompatible material, usually titanium, to which your jaw bone naturally bonds over a period of around three months. Once this has happened, a prosthetic, custom-made tooth is permanently attached to the implant. Implant surgery is extremely high-tech and uses state-of-the-art equipment. A 3D scanner is used to get digital image of your jaw onto which the implants can be virtually placed and your new smile previewed. Drilling guides are created using computer guided technology, and laser surgery means that there is very little trauma to the implant site, and recovery is fast. How long does it take to have implants fitted? The whole process takes on average around 6 months to complete. Your first session will be an extensive consultation during which your dentist will assess your suitability for treatment and take 3D images of your jaw. The next stage is surgery, during which the implants are placed. After waiting around 10 weeks for the implants to successfully integrate with the jaw, you’ll be able to return for the final fitting of your permanent teeth. No – implant placement is usually carried out under local anaesthesia or IV sedation. The vast majority of patients report little or no discomfort during surgery. After surgery, your dentist will provide you with a comprehensive aftercare plan to manage any swelling or discomfort; recovery time is usually swift and most patients feel back to normal within two weeks. Enjoy a FREE IMPLANTS CONSULTATION ! !